We’re currently watching the BBC series A Cook Abroad and in the episode where Monica Galetti visits Franche-Comté we were inspired to cook Morbiflette. We found a recipe on the InterFrance website. Onions, bacon, boiled potatoes, white wine and seasoning are fried together. 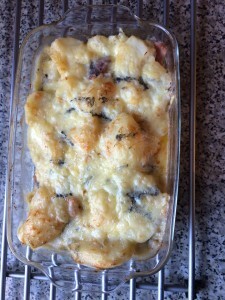 The mixture is transferred to an ovenproof dish, slices of Morbier cheese are placed on top and the dish is baked in the oven until the cheese melts. The Morbier cheese imparts a unique flavour to the dish. We served it with a green salad. Interfrance recommend a light Côtes du Jura Chardonnay to go with Morbiflette. 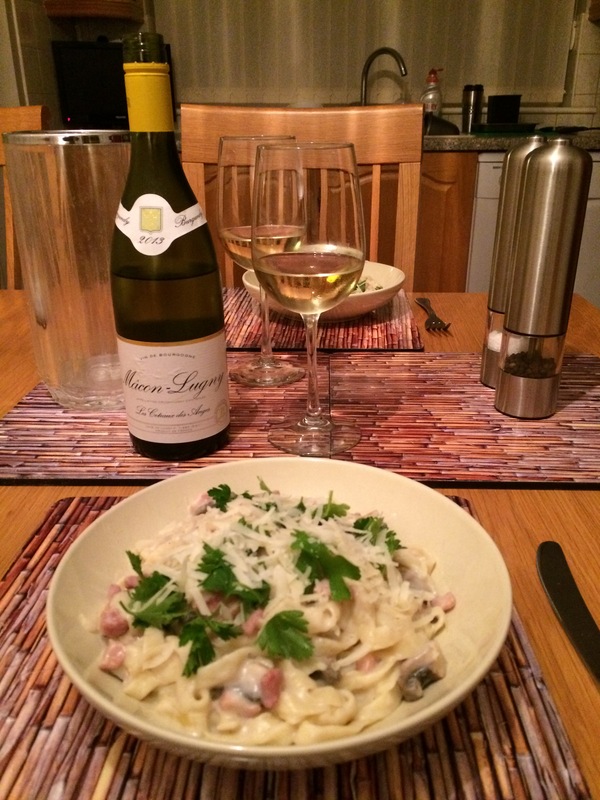 We didn’t have one, so we opened a bottle of Macon-Lugny, Les Coteaux des Anges 2013, a white Burgundy from Costco. We detected peaches on the nose, a hint of apples on the palate, followed by lemons, a note of orange and a little butteriness. The wine was a very good match. 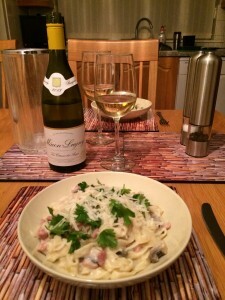 We found a Tagliatelle Alfredo recipe on the Wine Society’s website ideal for using up leftover ham a few weeks back but didn’t get around to trying it. The pasta sauce contains mushrooms, lemon juice, black pepper, white wine, cubed ham, (we used pancetta instead) and creme fraiche. The tagliatelle is garnished with chopped parsley and shaved Parmesan. The Wine Society recommend a white Burgundy pairing, but we didn’t have the one they suggested. 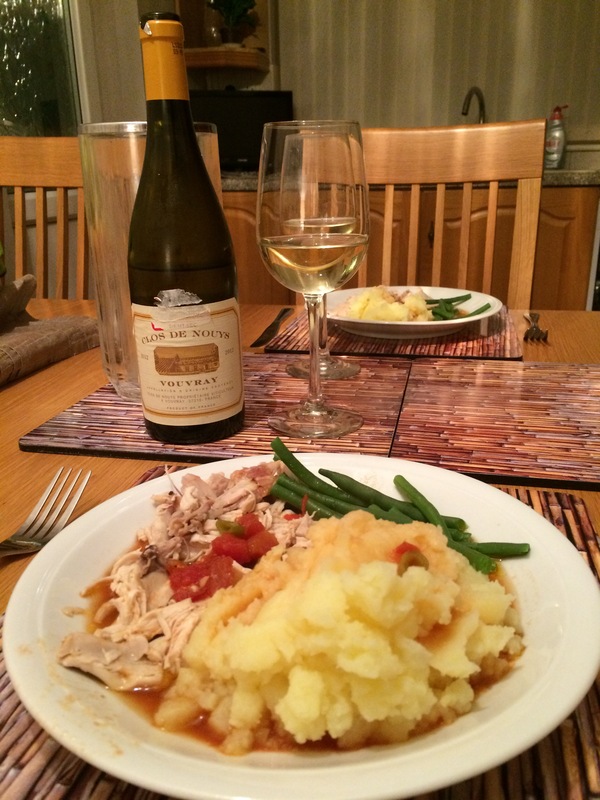 However, we did have a bottle of Macon-Lugny, Les Coteaux des Anges 2013, a white Burgundy from Costco. We tasted a slight creaminess, with crisp citrus flavours of oranges and lemons. A very good match with the pasta. We cooked Devilled Chicken, a Supercook recipe that we hadn’t done for a long time. A whole chicken is simmered in a stock made from water, carrots, celery, bouquet garni, peppercorns and salt. The chicken is then cut into serving pieces and grilled. A sauce is poured over at the end made from Worcestershire sauce, tarragon vinegar, shallots, lemon juice, garlic, chicken stock, chopped canned tomatoes, black pepper, salt and bay leaf. We served with mashed potato and green beans. The sweetness in the sauce called for a wine with some sweetness to match. We tried a bottle of Clos de Nouys Vouvray 2012, a medium-dry French white from Waitrose. 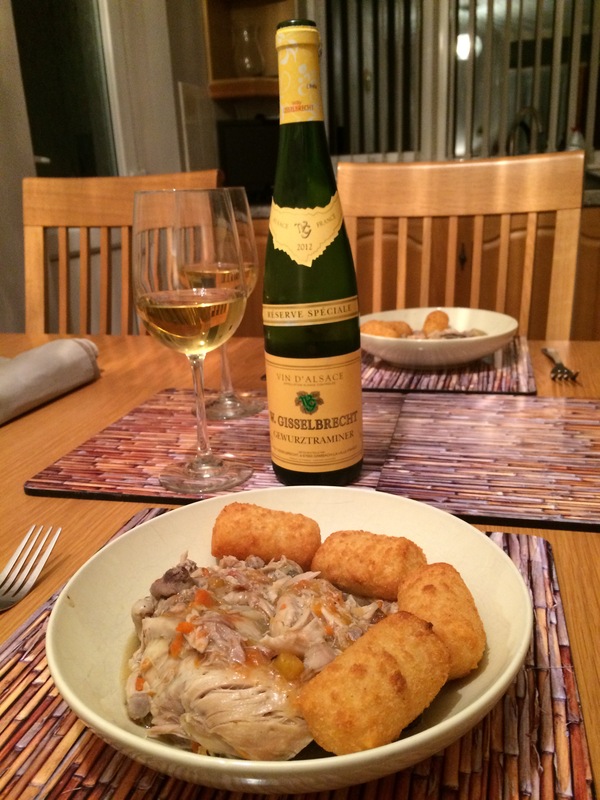 We tasted pineapple sweetness, peaches and apricots and we found this a very good match with the chicken. A drier wine would not have worked. 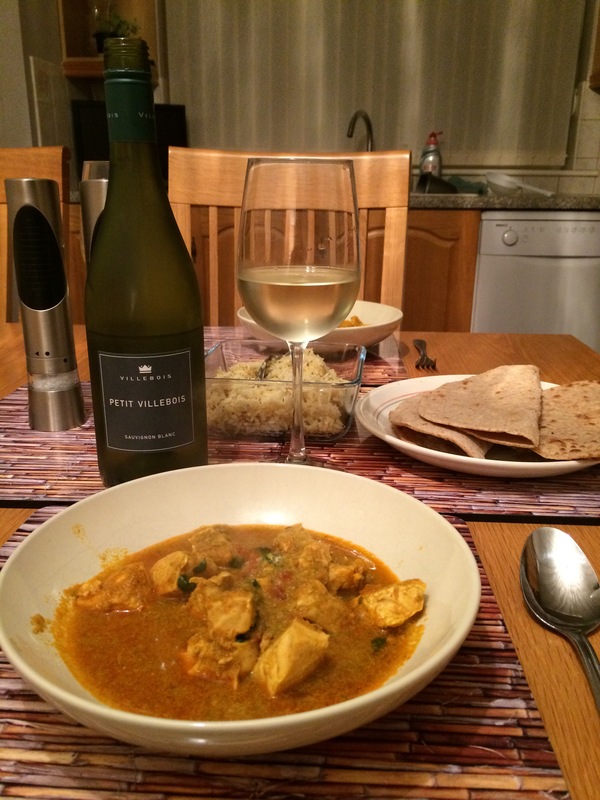 We were looking for a Chicken Balti recipe online and found this one from Spices of India. Cubed chicken is cooked with onions, ginger, garlic, tomato, green pepper, turmeric, yoghurt, green chilli, cardamon, bay leaf and fresh coriander. We used Waitrose Balti paste. Spices of India say this recipe is in the authentic British restaurant style. A very enjoyable curry that we served with rice and parathas. 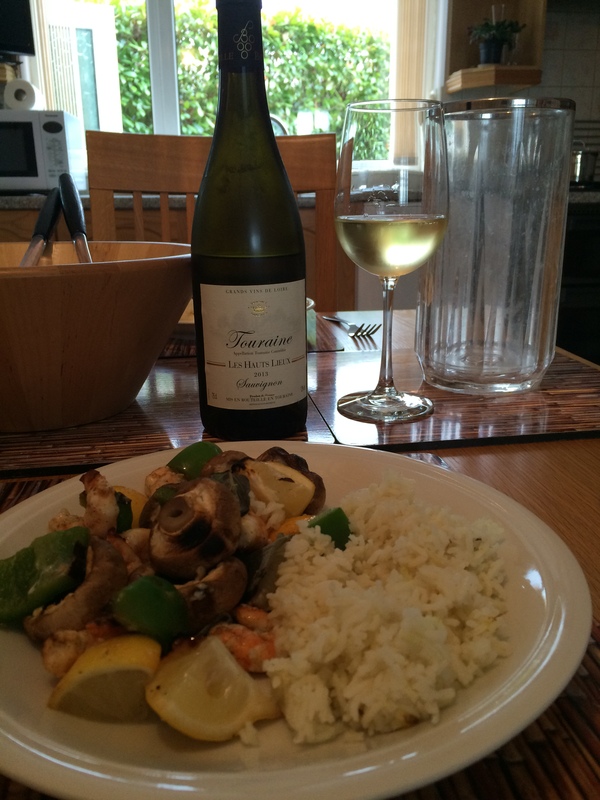 We opened a bottle of Petit Villebois Sauvignon Blanc 2013, a French white from Naked Wines. 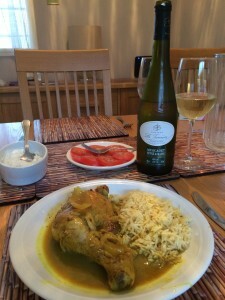 We last drank this wine with a West African chicken dish. As before we tasted apples and minerality, but this time there was more grapefruit coming through on the crisp finish. An excellent match with the meal and even better than last time. 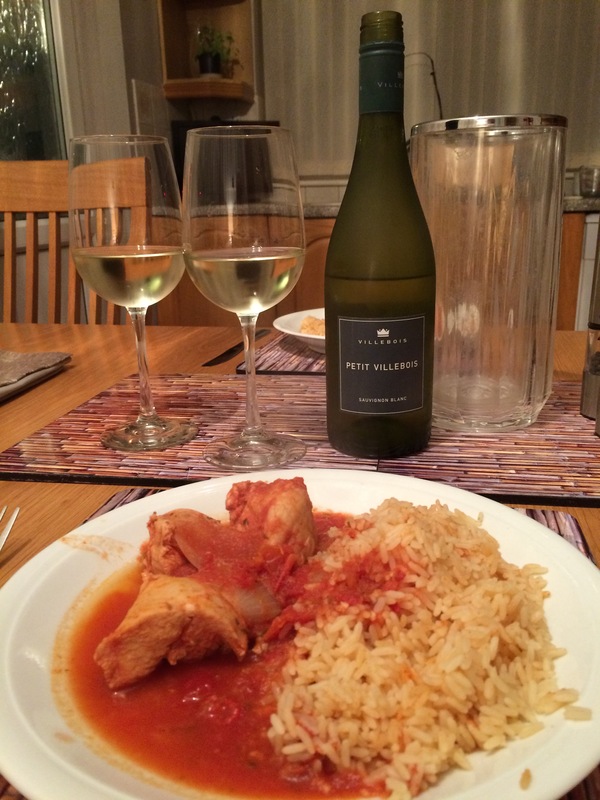 For a straightforward midweek meal we tried Jollof Chicken and Rice from Best Chicken recipes. 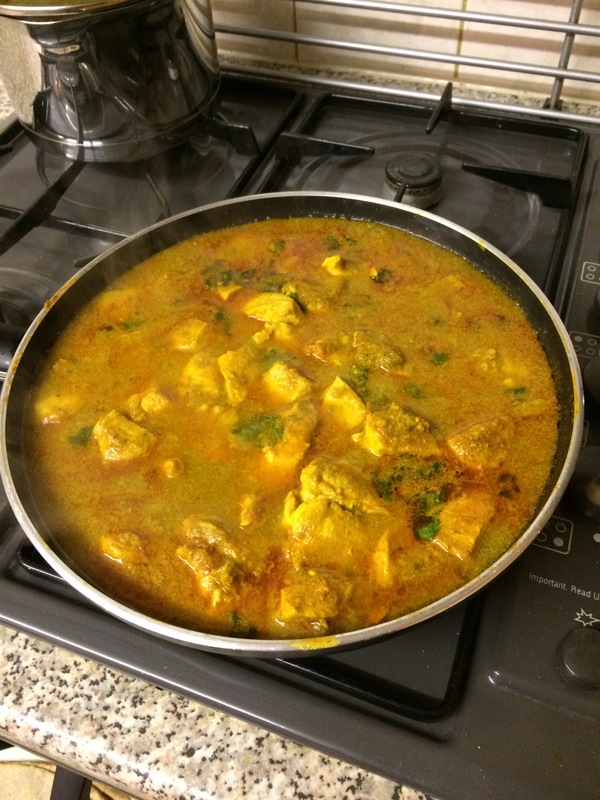 This is a well-known West African dish and the version we chose involved cooking chicken pieces with garlic, t hyme, canned tomatoes, tomato purée, onion, chicken stock, dried ground shrimps, green chilli and long-grain rice. 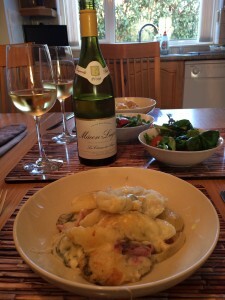 A pleasant meal, but we would look to try a more flavoursome version next time. 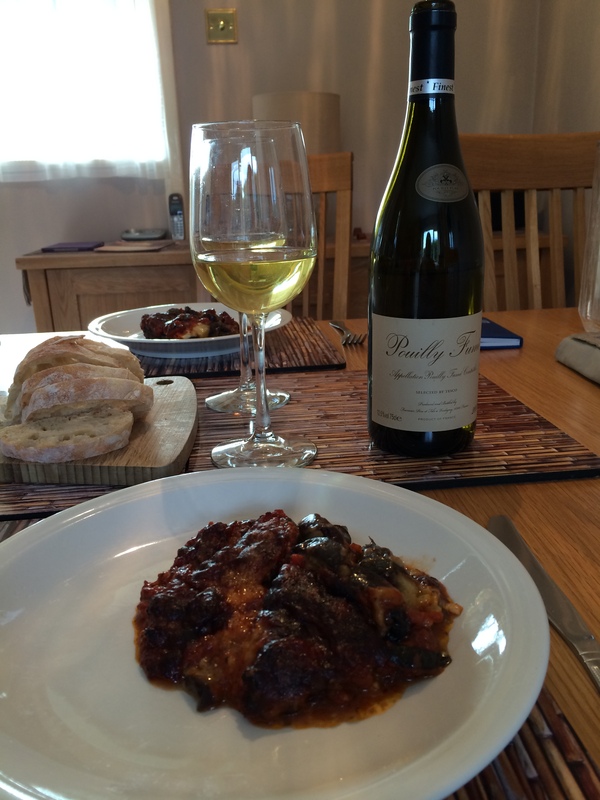 French Sauvignons are often good with dishes with tomato sauces and we opened a bottle of Petit Villebois Sauvignon Blanc 2013, a French white from Naked Wines. This was crisp with flavours of apples and grapefruit, some minerality and a fresh and tangy finish. A very good match with the meal. We cooked the Supercook version of Pollo alla Cacciatora (Hunter’s Chicken). This is a less intensely-flavoured version than Jamie Oliver’s. (See here for wine pairings with that recipe). Chicken pieces are casseroled with garlic, spring onions, mushrooms, white wine, chicken stock, tomatoes and bay leaf. The dish is garnished with fresh parsley and we accompanied it with croquette potatoes. Gewürztraminer is considered by some to be a very good match with Chicken Chasseur, which is the French equivalent to this dish, so we opened a bottle of Gisselbrecht Gewürztraminer 2012, an Alsace white from Costco. The wine was deep gold in the glass and the flavours were rich, fruity with notes of lychees, nectarines, apricots and a creamy sweetness. A very good match with the chicken. We tried a classic dish of Italian cuisine, Eggplant Parmesan from Supercook. Aubergines (eggplant) and Mozzarella cheese are baked in the oven in a sauce containing onions, garlic, canned tomatoes, tomato purée, basil, cayenne pepper, and seasoning. Grated Parmesan is sprinkled over. We served the dish with Ciabatta. 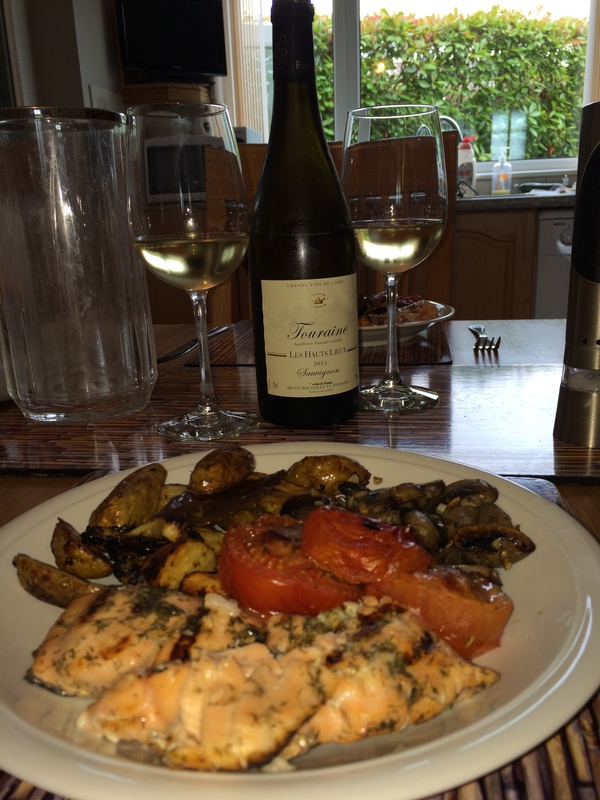 We often try and find a wine to match the cuisine but instead decided to pair this dish with a bottle of Tesco’s Finest Pouilly Fumé 2008, a French white. We detected gooseberries on the nose and tasted hints of grapefruit zest and a smoky honeyed creaminess. We thought this excellent wine was a good match with the meal. Supercook’s Madras Chicken Curry is one of our favourite curries and is flavoured with mustard seeds, onion, ginger, garlic, turmeric, coriander, chilli powder, fenugreek, cumin, black pepper, coconut milk, creamed coconut, bay leaves, lemon juice and green chillies. We serve it with fresh tomatoes, yoghurt and cucumber raita and rice. 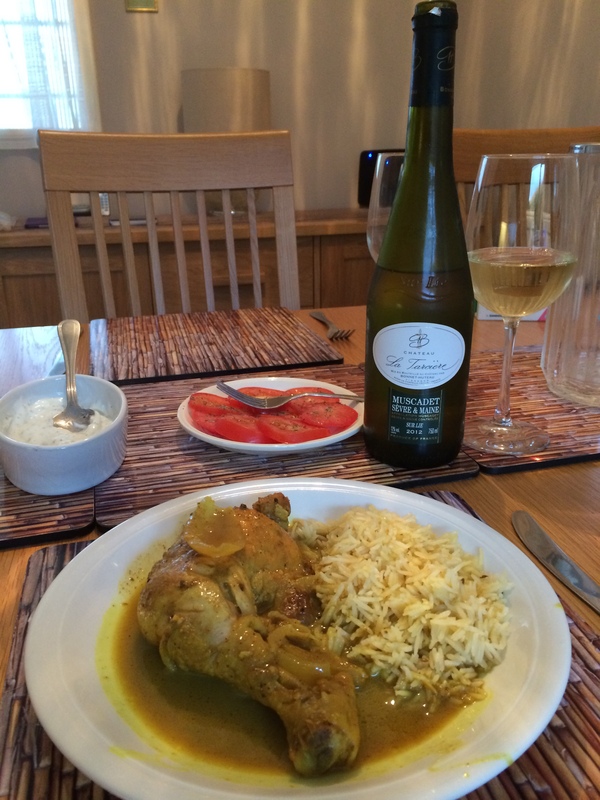 Our wine pairing choice for the curry was a bottle of Chateau la Tarcière Muscadet-Sèvre et Maine sur Lie 2012, a French white from the Wine Society. The wine was creamy with a melon and citrus tanginess and it was full enough to cope with the flavours of the meal. A very good match.